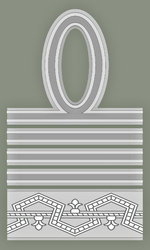 Marshal of Italy sleeve rank insignia (1933-1945). Insignia for the shoulder of the rank of Marshal of Italy (1945-1947). Marshal of Italy (Italian: Maresciallo d'Italia) was a rank in the Italian Royal Army (Regio Esercito). Originally created in 1924 by Italian dictator Benito Mussolini for the purpose of honoring Generals Luigi Cadorna and Armando Diaz, the rank was granted to several other general officers from 1926 to 1943. The rank was the highest in the Italian Army prior to the creation of the rank of First Marshal of the Empire in 1938. The rank of Marshal of Italy was abolished in 1946 with the creation of the Republic of Italy. The equivalent Royal Navy (Regia Marina) rank was Grand Admiral (Grande Ammiraglio), while the equivalent Air Force (Regia Aeronautica) rank was Marshal of the Air Force (Maresciallo dell'Aria), all of them abolished for the Armed Forces of the Republic of Italy. Marshal (Italy) – an intermediate rank between sergeants and officers. ↑ Page of the Italian Army (Esercito Italiano) home site - www.esercito.difesa.it. This article is issued from Wikipedia - version of the 5/6/2014. The text is available under the Creative Commons Attribution/Share Alike but additional terms may apply for the media files.